Zygouris & Glass (2004: 2) story mapping facilitate comprehension and memory of stories, students need to know about the general structure of stories. One tool, teachers can use to help students understand story grammar is the story map. 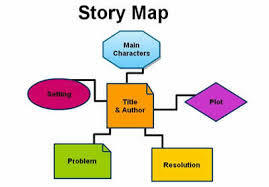 Story maps are templates that provide students a concrete framework for identifying the elements of narrative stories. Dixon (2012: 21) Story retelling is way of assessing if the reader can identify key story elements. In story retelling, students are asked to recount what they have read. Through the retelling, students identify major elements. Teachers can allow students to use a story map to guide their retelling. This can be used for biographies, autobiographies, historical or current events. Details included may be: People, location, time period, major challenge/accomplishment/event, and life/event details. Zygouris & Glass (2004: 2) the effectively use of this strategy, teachers should model how to identify story grammar elements. First, introduce the story map by explaining the importance of story grammar. Most stories have certain elements in common. Remind students that most stories have a beginning, which includes the time of the story, where it takes place, and introduces the main character(s). An event then sets a problem or conflict in motion, which is followed by attempts to reach the goal or resolve the conflict. Finally, the goal or conflict is resolved in some way and the main character(s) react to the outcome. 1. Discuss what happened in the story or reading passage and the students’ reaction to it. Discuss the setting, names of the characters, the story problem, and the solution. 2. After reading the entire book/passage, give each student a piece of paper. 3. Have the students fold the paper in half lengthwise, then twice widthwise, to make eight symmetrical rectangles. 4. In the ﬁrst rectangle, have the students write the title and author of the story. Belum ada tanggapan untuk "STORY MAP IN READING"